"LAKSHMI" IS WORSHIPPED AS THE GODDESS OF PROSPERITY, MATERIAL AS WELL AS SPIRITUAL. SHE IS ALSO THE GODDESS OF WEALTH, LIGHT, WISDOM, AND FORTUNE. SHE IS ALSO ASSOCIATED WITH GOOD LUCK, BEAUTY, COURAGE, AND FERTILITY. SHE IS MOTHERLY AND GENEROUS, AND IS BELIEVED TO BE THE MOTHER GODDESS WHO IS KNOWN BY MANY NAMES. "LAKSHMI I"S KIND AND MERCIFUL TO THE NEEDY AND ALWAYS LOOKS AFTER THEM. 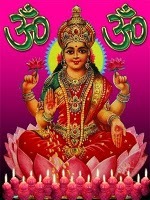 HINDUS BELIEVE THAT SHE BRINGS GOOD LUCK, ESPECIALLY FOR PEOPLE WHO HAVE SHOPS OR OTHER BUSINESSES. SHE IS SUPPOSED TO VISIT HOUSES WHICH ARE CLEAN AND TIDY. IT IS BELIEVED THAT " LAKSHMI" RESIDES PERMANENTLY IN WHITE CONCH SHELLS THAT OPEN ON THE RIGHT SIDE. SHE IS DEPICTED AS A BEAUTIFUL WOMAN SEATED ON A LOTUS, DRESSED IN PRETTY CLOTHES AND PRECIOUS JEWELS, SITTING OR STANDING ON A LOTUS. HER EXPRESSION IS ALWAYS CALM AND LOVING. SOMETIMES HER ANIMAL VEHICLE, THE OWL, IS DEPICTED WITH HER. "LAKSHMI" IS INVOKED TO EARN THE BLESSINGS OF GOOD THINGS OF LIFE AND IF SOMEBODY SUFFERS ANY LOSS IN BUSINESS, IT IS BELIEVED.